Many have questioned whether the 340 cipher was a genuine offering by the Zodiac Killer, designed to reveal a complete message similar to the 408 cipher- and did the Zodiac Killer hide the key to the 340 cipher in one of his other communications? The answer to the last question is almost certainly yes, but the answer to the first question is almost certainly no. The Zodiac Killer actually admitted in one of his correspondences that the 340 code was not a cipher. One of the best finds in recent years was by Tahoe27, a regular contributor to the Zodiac Killer Site forum, who discovered a connection between a Tim Holt comic and the 'Halloween' card. Many features on the cover of the comic parallel the 'Halloween' card, including the wording By Fire, By Gun, By Rope and By Knife, along with "Redmask" (the skeleton eyes) and "Lady Doom" (peek-a-boo you are doomed). However, I believe Tahoe27 is not convinced that the 'Halloween' card was authored by the Zodiac Killer. If the 'Halloween' card was authored by an impostor, who based the 'Halloween' card on the Tim Holt comic, then are we to believe he was extremely fortunate that a year earlier, the real Zodiac Killer just happened to create a 340 cipher containing the word "BY" in all four corners of the cipher, along with PARADICE and SLAVES being a possibility, running down and across the cipher on the midpoint vertically and horizontally, just like the configuration on the 'Halloween' card. Admittedly, the words paradice and slaves have not been proven to exist in the 340 cipher, but the fact they are a distinct possibility by comparison to the 'Halloween' card appears another very fortunate stroke of luck- particularly if we believe the author of the 'Halloween' card wasn't the Zodiac Killer- and only considered the Tim Holt comic in his design of the 'Halloween' card. If the 'Halloween' card was crafted by the Zodiac Killer using only the Tim Holt comic, then the above still applies. The more likely conclusion we could draw from this, is that the 340 cipher was designed with the Tim Holt comic in mind, and the 'Halloween' card (one year later) was giving us a clue. On the right, we can see how the four words "BY" fit into each quadrant of the 340 cipher just like the 'Halloween' card offering. What are the odds that in each quadrant of 80 characters we would find the letters B and Y together either horizontally or vertically every time. Not to mention the fortunate appearance of paradice and slaves bisecting the cipher perfectly. The killer may even have given us his signature in the bottom right corner, along with the running total, which was seven and counting on November 8th 1969. 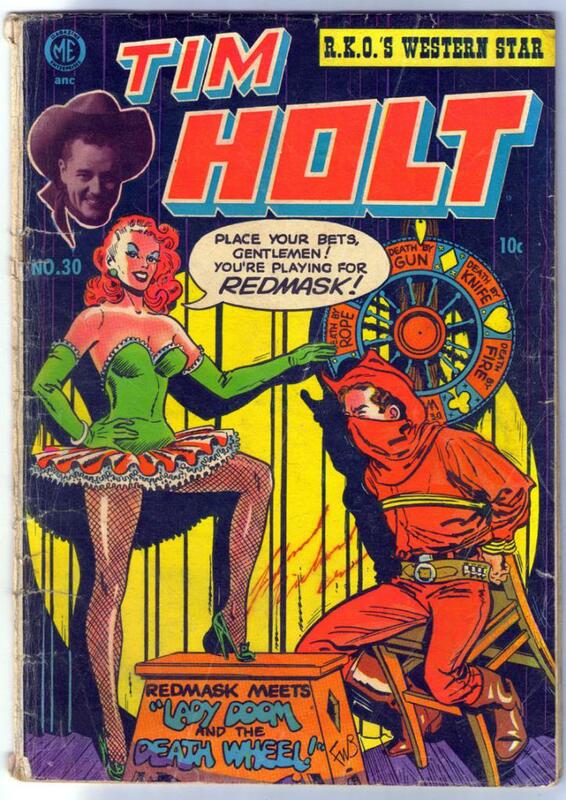 If this wasn't the intended design of the 340 cipher, then either the Zodiac Killer or an impostor got extremely lucky, in just happening upon a Tim Holt comic that mirrored the 340 cipher unintentionally. But we may just be able to prove a definite link between these two communications and confidently state that both were designed by the Zodiac Killer, and with a fair degree of confidence, argue that the 340 cipher is not a cipher in the true sense of the word. The majority of the characters likely filler, but in this instance, far more than the 18 characters at the foot of the 408 cipher. The reason we may be able to contend the 340 cipher is not a continuous and uniform message like the 408 cipher (and not a cipher as we believe one to be), is because the Zodiac Killer lined us up for a fall and then admitted to it a year later. "This is the Zodiac speaking. I though you would nead a good laugh before you hear the bad news. You won't get the news for a while yet. Could you print this new cipher in your frunt page? I get aufully lonely when I am ignored, so lonely I could do my Thing." Was that bad news to come on October 27th 1970, when he mailed the 'Halloween' card. If we believe that the 'Halloween' card design is referring back to the 340 cipher, then the message concealed on the envelope inner of "sorry no cipher," is the Zodiac Killer finally admitting that the 340 cipher is not the real cipher we had thought. He is declaring that the 340 is "no cipher," and is in fact, based upon the paradice and slaves configuration. This is why he crosses the phrase "sorry no cipher" to mimic the design of paradice and slaves, using 13 letters in both instances. The Zodiac Killer could easily have written "sorry no cipher" just the once, but deliberately fashioned it to form a link between the 'Halloween' card design and the 340 cipher. After searching for solutions to the 340 cipher for nearly half a century, the Zodiac Killer may have given us the answer to its design after just one year, but it was overlooked. We have took the phrase "sorry no cipher" as an apology, that he wasn't giving us a cipher in the 'Halloween' card, when in actual fact, he was apologizing for stringing us along for the best part of a year, and offered us the real solution to the 340 cipher on October 27th 1970, contained within the 'Halloween' card. You could say it was a "trick" and "treat" befitting of Halloween. However, there is still a little more to find regarding the methods of death and how they configure within the 340 itself - so the search is not over yet. ​Cipher Explorer tool below, courtesy of Zodiac Killer Ciphers. Do not forget John Rose 340 solution that you covered in a previous article. Using simple substitution as in the 408, I think it is the best partial solution to date. Yes, the John Rose 'solution' was the best effort I've seen at cracking the 340 cipher without manipulation. Even if it was a small sample size. I've never been a fan of using anagrams in the solution. There seems little reason to encode a message that needs further decoding once decoded- if that makes any sense Shawn. Yes I think you are correct here Richard. I wonder if they are able to determine who the Zodiac Killer is based on DNA, if it will reveal any clues to the ciphers? So he fancies himself as a cartoon character come to real life. What kind of maturity level are we dealing with here? I believe the Zodiac was relatively intelligent. He wasn't the master criminal he has seemingly evolved into. Probably a BTK level of intelligence, but equally lacking empathy for others. But in truth Judith, I'm no psychologist, so Zodiac could be literally anybody. I looked up the median age for marriage in the USA in 1970 and it stated 23.2 for males and 20.8 for females. The mean age for motherhood in the USA in 1970 was 24.6 years. The mean age for first birth was 21.4 years. Kathleen Johns described the interior of the vehicle "as messy, she had noticed men's and children's clothing scattered about, books and papers, a black rubber handled flashlight, and two colored plastic scouring pads on the console dashboard. Kathleen estimated that the smaller patterned T-shirts were of the age range 8-12 years." Having children out of wedlock in 1970 was a little more taboo in 1970, so if the mean age of 1st birth was 21.4 years, and Zodiac was married with children, and of similar age to his wife, she would have been around 33.4 years of age, if her eldest child was 12. This relies heavily on average statistics, but this would make Zodiac around 33-35, and likely graying at the rear as described by Donald Fouke. It would also place the age of the Zodiac midway between the older and younger age estimates. Of course, assuming the Kathleen Johns abduction was a Zodiac crime. This is great! I love this explanation for the 'bad news' and 'sorry no cipher'. This is an absolutely terrific suggestion Richard! Thanks a lot Drew. I was looking to extend this article, but I am just not sure about this next proposition, because you start reaching or forcing ideas. The second A of paradise falls on the middle of the 340 cipher, as it does the Halloween card. Then the DICE part begins immediately after the middle of the 340 cipher, as it does the Halloween card. I was therefore trying to read the Halloween card inner.out loud. The eyes translating to "look for" and the the 4-TEEN to 14. (look for 14). Or "look for BOO". Probably getting well off base here, but in the 340 cipher above BOO is on the 14th line, bisecting the I and C of paradice. It's a bit of a reach at the moment, but I can't help thinking there is something really important somewhere else on this card, possibly the strange symbol has a part to play. Anyway, take this with a pinch of salt for the moment. Hopefully somebody can spot something more significant with the remainder of the Halloween card inner. Tahoe27 has repeatedly said he/she doesn't believe the Halloween card was sent by Zodiac. The clues in the 340 cipher, as you demonstrate above and by John Rose are not readily apparent and seem to validate the Halloween card as a valid Zodiac communication. The 13 Hole Card, Oct 5, 1970. Do you know if the the October 5th, 1970, 13 Hole Card was withheld from the public until the March 13th, 1971 L.A. Letter was received? The 13 hole card has "I'm Crack Proof" in it. The later L.A. Letter has "I'm Crack Proof" in it. Seems like the L.A. Letter with "I'm Crack Proof" validates the 13 hole card with "I'm Crack Proof" as a valid Zodiac letter. More so if the 13 Hole card was withheld from the public until the L.A. letter was received 6 months later. or visit my Halloween card page. The October 5th, 1970 13 hole Card has "In the Beginning" Apollo Stamp and so does the October 27th, 1970 Halloween card mailed 22 days later. If the Halloween Card is valid, as it appears. I do not think Zodiac would just happen to use the same "In The Beginning" Apollo stamp on the Halloween card, if the 13 hole card was a hoax. An extremely good point Shawn. Yes- If somebody had hoaxed a card in your name, it doesn't really make much sense to validate the 13 Hole postcard by copycatting the copycat and using the same stamp. Unless of course, he thought the 13 Hole postcard was worthy of him. But certainly, taking the word "crackproof" to the LA letter and applying the same stamp to the Halloween card goes a fair way to validating the 13 Hole postcard. But does this lend weight to the Adams postcard. It's very interesting that the Zodiac is so notorious as opposed to the Golden State killer. But it seems to me that the Zodiac became intimate with us through his letters and his ciphers, for engaging his audience, letting you know how he feels, that he became someone that we all know. You only hurt the one you love. The Zodiac was just tying in various themes from his other correspondence to prove that he authored them all. "It is all MINE, MINE, ME, ME, MINE, MINE"!!! He could pen crazy crap and still come away seeming highly intelligent and un-crackable. He was an egotistical media whore, a crazy Riddler/Joker emulator, and a drama Queen to boot. The 340 was his greatest, most egotistical, most dramatic joke.